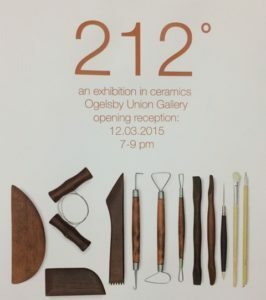 Please join FSU Art from 7-9pm on 12/3/15 for an opening of the show 212˚. The exhibition has the work of 11 student artists working in ceramics. They are showing the work they created this fall semester in a group show at Oglesby Art Center. The show closes December 9th. Water Boils at 212˚ and when it is residual water can cause explosions in the kiln! In the exhibition, 212˚, eleven artists will show work that survived the boiling point and thrived. Please join us at the Oglesby Art Center opening!